This watercolor card was a study of a field by my house, (I was playing with composition elements.) I was also using a new watercolor pallet and wanted to try it out, the colors screamed fall field, so here is my loose and interpretation of the field by my house. 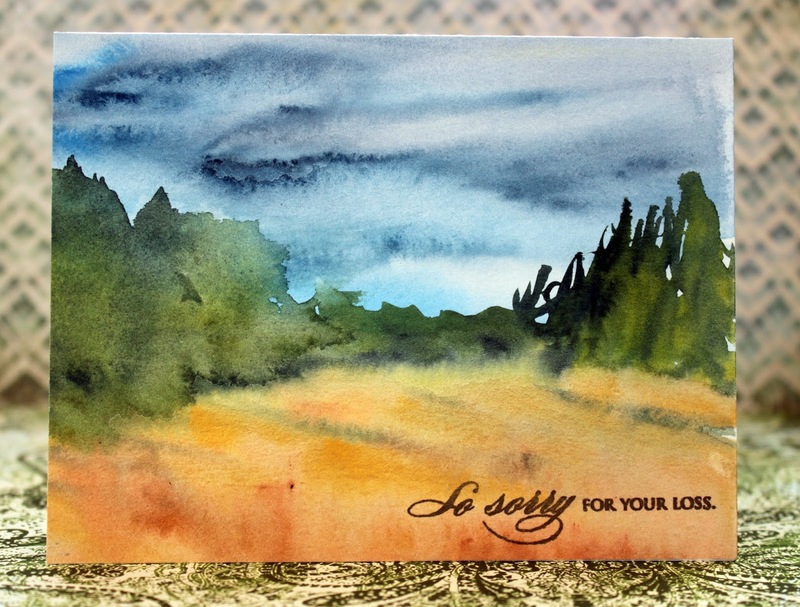 After this study, I cut it down to an A-2 Card base size, stamped the sentiment and I was on my way for a sympathy card that I hope to never give out in the fall. This will be first in the series called Just Sentiments. The sentiment used was by Penny Black. My first tip for Just Sentiments series: The sentiment has to marry the card front, or it will never work. Looking at the type font is a huge deal breaker! I like how this sentiment was elegant and worked with the feel of this card. If I had used a more trendy font, it never would have worked out so well! I am a watercolor mastery student from Angela Fehr, and I love her loose and intuitive style that I am honored to be taught by her! This card was inspired by her Landscape class. Of course, I recommend all of her classes, but this one has a lot of great tips to help you become your favorite artist. She also has an amazing free class that talks a bit about landscapes if you're not sure yet you want to take her course.